I will be at my favorite Chincoteague bookstore on Monday, July 27, 3-5PM, and Tuesday, July 28, 6-8PM, signing copies of "IN THE HERD." Stop by to chat and have your book personally inscribed! Can't wait to return to Chincoteague for Pony Swim Week. I will be at the CVFC Info booth on Wednesday and Thursday evening, 7PM - 10PM. Get your book personally inscribed. I am looking forward to meeting and chatting with you. And, in celebration of the CVFC 90th anniversary one person will be randomly selected by me each night to receive a complimentary book. I am so excited about returning to Assateague for two presentations and personalized book signings at the NPS Visitor Center, 11800 Marsh Lane, Berlin, MD. NOVEMBER 21, 5:30pm-7:30pm: Assateague Island Alliance will present its first 'Foster Horse Parent' event as a thank you for their support of the Assateague MD horses. I will be discussing my experiences shooting the images for IN THE HERD and the stories behind them. Allison Turner, NPS Biological Science Specialist, will be available to answer questions about her experiences with the MD herd and specific horses, past and present. There will be refreshments! RSVP to Ashlie at OutreachAIA@gmail.com . This is an extraordinary show and the annual flagship event for Dressage4Kids (D4K), a non-profit organization, founded by Lendon Gray. Its mission is to provide educational and competitive opportunities for youth riders and the adults who support them. I will be at YDF in Saugerties to sign my book on Saturday, August 9th, 10:30am – 3:30pm. 20% of all book sales will be donated to D4K. Looking forward to a great day! Pony Swim Week is almost upon us! I will be at the Carnival Grounds on Wednesday and Thursday, July 30th and 31st, from 7:00 – 10:00pm at the Chincoteague Volunteer Fire Company (CVFC) Information Booth. I am looking forward to signing books and meeting many pony lovers. 20% of all book sales will be donated to the CVFC Building Fund. Stop by this wonderful independent bookstore on Monday, July 28th, 3:00 – 6:30. I will be there to sign copies of my book, “IN THE HERD: A Photographic Journey with the Chincoteague Ponies and Assateague Horses.” 4065 Main Street, Chincoteague, VA. I am looking forward to signing my coffee table book, “IN THE HERD: A Photographic Journey with the Chincoteague Ponies and Assateague Horses,” from 10am - 1pm. Come by the Assateague Island National Seashore Maryland Visitors Center on your way to or from the beach. Hosted by the Assateague Island Alliance, in concert with Eastern National. The Visitors Center is located at 11800 Marsh View Lane, Berlin, MD. I will be signing my photo documentary book, "IN THE HERD: A Photographic Journey with the Chincoteague Ponies and Assateague Horses," from 10am - 4pm, June 13-June 15. Come by the USET Foundation table, near the VIP tent, between classes. 20% of book sales will be donated to the USET Foundation Gladstone Fund, which will be used to preserve this important legacy and historic facility. What an honor to be at this extraordinary event! www.intheherd.com and www.facebook.com/intheherd 1040 Pottersville Rd., Gladstone, NJ. I want to express my gratitude for an amazing journey with the first edition of IN THE HERD. I am deeply honored that my book is now in the hands of more than 1200 readers. Thanks to you, Tridor Press released a second edition of IN THE HERD in January, 2014. There are a few cosmetic changes with a few updates to statistics. Otherwise, the content of the book remains the same. I am excited about a second edition launch and new book signings in 2014. On Saturday, December 7th, 1:00-4:00pm, I will be signing my book, ‘IN THE HERD: A Photographic Journey with the Chincoteague Ponies and Assateague Horses,’ at Beval Saddlery. A wonderful place to do your holiday gift shopping! You may also call Beval’s to preorder your personally inscribed book for the event at 908-234-2828. The Gladstone store is located at 10 Lackawanna Avenue. On Saturday, November 30th, I will be signing my book at the Voracious Reader bookstore from 12:00-1:00pm. I will be there most of the day, volunteering for Small Business Saturday and honoring our independent retailers. It will be a fun day, to be sure! Get your book signed and celebrate The Voracious Reader at 1997 Palmer Ave., Larchmont, NY. On Sunday, November 24th, I will be returning to Bank Square Books for a book signing from 12:30 – 2:30pm. Get a jump on your holiday shopping! Drop by to chat about the world-famous ponies and horses and have your book personally inscribed. 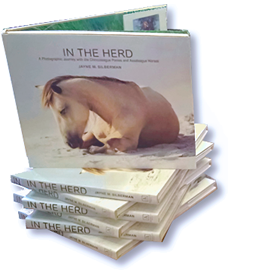 IN THE HERD may be pre-ordered by phone at 860-536-3795 or email at banksquarebks@msn.com . Bank Square Books is located at 53 W. Main Street. Assateague Island Alliance welcomes Jayne M. Silberman, author of “IN THE HERD – A photographic journey with the Chincoteague Ponies and Assateague Horses.” Presented in concert with Eastern National, Silberman will sign copies of her book at the Visitor Center on Saturday, November 9, 2013 from 10 a.m. to 1 p.m.
New to this event, Silberman will present highlights of her experiences collecting images at 11am followed by the Park’s side of the horse story presented by NPS Science Communicator Kelly Taylor. Enlightening and inspiring, this presentation will leave you viewing the horses from a new perspective. In the Herd is only available for purchase at select locations; Assateague Island Visitors Center is one of them. Come out to meet the author and have your copy personally signed. I will be signing books at the Hampton Classic on Sunday, August 25th, from 11:00 - 2:00 pm. Stop by the ASPCA Patio to learn more about the world famous Chincoteague ponies and Assateague horses and have your book personally inscribed. Twenty percent of the proceeds from all book sales will be donated to the ASCPA Equine Fund. This Fund provides grants to support the welfare, well-being, and safety of horses in the United States. On Saturday, August 3rd, I will be signing books from 12:00 – 2:00 at this wonderful book shop in Mystic, CT. Drop by to chat and have your book personally inscribed. Bank Square is located at 53 W. Main Street. Look for me at the CVFC Carnival Grounds on Wednesday and Thursday, July 24th and 25th, from 7:00 – 9:30 at the CVFC Info Booth. I will be signing books and donating a portion of all book sales to the CVFC Building Fund. Pony Swim Week is just around the corner! Stop by this marvelous store on Sunday, July 21st, from 5:00 – 8:00, to chat and get your book personally signed. The Kite Koop is conveniently located on Main Street, Chincoteague, VA. I will be signing books at this extraordinary show on Saturday, July 13th, from 10:30 – 4:30. A portion of the proceeds from all book sales will be donated to D4K. ‘Lendon’s’ YDF is the annual flagship weekend event for Dressage4Kids (D4K), a non-profit 501(c)3 organization. Its mission is to provide educational and competitive opportunities for youth riders (ages 21 and younger) and the adults who support them. On Saturday, June 29th, from 10:00 – 1:00, I will be signing my book in the gift store at the fabulous new Maryland NPS Visitor Center. Stop by to meet me on your way to the beach, purchase a book, and have it personally inscribed. The Visitor Center is located on Route 611, just before the Verrazano Bridge to Assateague. I can’t wait for this event on Saturday, June 22nd, from 11:30 – 3:30. I am looking forward to meeting new and old friends. Drop by, chat about the Chincoteague ponies and Assateague horses, and have your book personally signed. The Cheshire Horse is located at 8 Whittlemore Farm Road in Swanzey, NH. I will be at this wonderful tack shop on Saturday, April 20th, from 11:30-3:30. Stop by, chat about the world-famous Chincoteague ponies and Assateague horses, and have your book personally signed. Barnard’s Saddlery is located at 3209 State Route 23, Oak Ridge, NJ. A number of book signing events have already been scheduled for this spring and summer in the mid-Atlantic and New England regions. I will announce specific locations here and on FB http://www.facebook.com/intheherd as we get closer to the events. If you would like to host a book signing event please contact me. The holidays are over and I am thrilled to report that more than 500 books have been sold. The interest in my book has been huge! Few books of this kind have such a high success rate. I am over the moon! I will need to print more books soon. Thank you everyone! The backdrop for this event was the NYU bookstore in NYC. We had a lively discussion about the horse and pony herds. Everyone loved the slideshow of selected images from the book. Spent a day in Bedford, NY at The Horse Connection, an equestrian shop, signing books. Another great success! And, it was a great opportunity to catch up with old friends and meet new ones. I was so pleased to see old friends who stopped by and meet new ones. I have sent The Horse Connection more signed books. They sold out over the holidays. I was honored to be interviewed by Diana Reiss, Ph.D., who wrote the Foreword to In The Herd. There was standing room only in what was once the dining room at the landmark Roosevelt House in NYC. The room was decorated with a few large canvases of In The Herd images. A spectacular event to celebrate my book. Huge attendance and rave reviews! Also, a book signing for "First Fridays” at a local independent bookstore. Sold out of all the books that had been shipped out to Montana! In the Herd has arrived! Very exciting to see my book in print! The ‘dummy’ book made its debut at Book Expo America 2012 on June 5th. After almost four months of steady work, my book is ready to go to print. Copy-editing, book layout, font and cover selection, acknowledgements, and several reviews for errors … done!